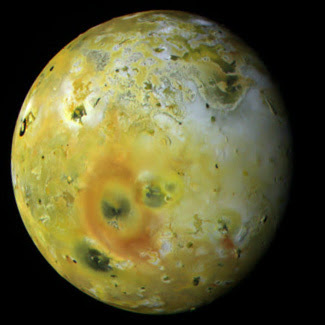 Io (pronounced EYE-oh) is one of the four largest moons of Jupiter, the so-called "Galilean satellites", named after their discoverer Galileo Galilei (the father of modern science) in 1610. Io is one of the more interesting moons out there. It is the fourth largest moon in the solar system (after Titan, Ganymede, and Callisto), and it is larger even than Pluto. But more noteworthy than this is its volcanism. The Voyager missions revealed in 1979 that Io is volcanically active--and perhaps the most volcanically active body in the solar system, with hundreds of volcanoes covering its surface. Uniquely, these volcanoes are powerful enough to spew their ejecta at speeds that exceed Io's escape velocity. In other words, Io has volcanoes that are ejecting right into space! This comes after years of incredible discoveries about Io, starting with spectroscopic and radio telescopic observations in the 1960s, to the Pioneer missions of the early 1970s, to the two Voyagers, to the master Jovian explorer of them all, the Galileo spacecraft of the 1990s. FYI: If you know where to look for Jupiter in the sky, you can resolve the Galilean satellites with steady hands and a pair of binoculars, but they look even better through a modest telescope. Further reading: Wikipedia articles: Observational History of Io; Name (incl. naming scheme for its features). Hat tip: Jeff Bryant via CUAS listserv.